While QC-PLC supports 100's of PLCs natively using our custom libraries, it also supports OPC (OLE for Process Control). This allows QC-PLC to be compatible with virtually every PLC on the market provided it has OPC support. QC-PLC acts as an OPC client and requires that a compliant OPC server be installed to translate from the PLC into OPC. 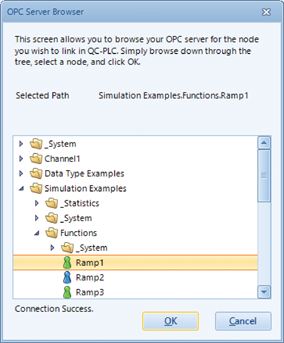 Once available, QC-PLC can connect to any OPC server via IP address and features a convenient OPC Server Browser (pictured at right). Traverse the tree in the browser to find the tag (PLC address) needed without having to know the actual address.